Auto Bravado, author of http://autobravado.blogspot.com/ has been told time and time again by auto store attendants, shop teachers, and others with the performance and efficiency hobbyists, such as me, that you look up the spark plug gap recommended by the manufacturer and you unerringly stick to it. 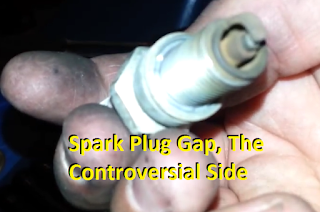 This is usually correct, but I'm going to offer you the the other perspective, even the controversial spark plug gap. I bring up to you case A, a 1999 Mercury Sable. Recommended material? Platinum. I bring up platinum as some mid 1990's and earlier Fords, Mercury is manufactured by the same company, don't work well with platinum. This station wagon, with every spark plug at exactly 0.044 inches went from running weak but smooth on its old not gapped spark plugs, to running rough and shaky on its newly gapped spark plugs! In order to balance this engine out, because anything but perfection is insufficient to please me in such a matter as the smoothness of an engine, which leads into its longevity, I had to balance the different amount of electrical resistance from each spark plug wire with the resistance in each spark plug. You see, the longer the wire, the more resistance, just as the bigger the gap in the spark plug gap, the more resistance. The 3 wires that went to the far side of the V6, which had longer wires, each required a spark plug gap of 0.042, while on the short side, the spark plug gaps had to vary between 0.046 to 0.048. In case B, I was testing whether a weaker sparking plug, like an NGK spark plug could function at the same level as a Bosch spark plug. You see, though NGK makes a longer lasting spark plug, Bosch makes a stronger one, but they have a higher fail rate in the manufacturing (complete article: The NGK Spark Plug Advantage). In every balancing case in a 2004 Nissan Frontier, V6, not turbo, a spark plug gap of 0.042, made the platinum NGK run as strong as the Bosch, proven by it running smoothly side by side with its counterpart under the same hood! Please note that the manufacture recommends a spark plug gap of 0.044 inches in the 2004 Nissan Frontier, V6, not turbo, and this should also be true of most other Nissan Frontiers. Happened to me in Jan. of '09: I've just finished being glad that I bought 10 for a 6 cylinder. Confused? I'll explain. I lost 1 under the hood somewhere and I measured the ohms of resistance on all of them to find 3 pairs of equal ohms resistance plugs, which I set on opposite sides of the V engine so that the lowest resistance plugs matched with the longest wire, which makes more resistance. And vice versa, the highest resistance met up with the lowest resistance, or shorter wires. I found this new new technique to have quicker results than tinkering with the spark plug gap in every plug off of the manufacturer specifications, but sometimes on tougher jobs you'll still need what your learned here on the controversial side of gapping to obtain the smoothest engine you did ever hear or feel. I know many mechanics that tell me I do too much when I do a tune up, but maybe they just need to realize that's why I'll make an identical car beat theirs off the line! This rounds out my discussion on the controversial side of spark plug gaps, but feel free to check out related articles on wires on: spark plug wires and dodge hemi spark plug wires. Above, I couldn't balance an engine with spark plug gap like I normally do, instead I had to judge how it was running and alter it accordingly. It worked out for my 1989 Yamaha XT600, but since I did go with a tighter gap, it was a sign of a stator going out, which I didn't realize until it did! (Stator, an internal component in alternators usually not replaced on their own, but it's normal to on a Yamaha motorcycle). I never read such a balanced article which covers all the electrical basics between wires, resistances, and gaps in the spark plug arena.